For those of you who love watching the race replay videos on BloodHorse.com, we have good news for you. The 7 day viewing restriction has been removed; race replay videos will now be available for free viewing at any point in time. 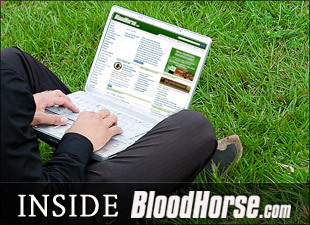 In addition, we've greatly expanded the amount of videos being offered on BloodHorse.com. Stakes, Allowance, and Maiden races have all been added to the site. Also new, every video can be seen in full-screen mode if that's your preference. While watching a video, simply click on the full-screen icon (it's a gray square with four diagonal arrows) and the video player will expand to the full width of your computer screen. Give it a try; we think you'll be pleasantly surprised with the video quality! You can access all of our race results, along with the replay videos, at the all-new Racing Results page. Just use the tabs to navigate through the various race types.